Facebook’s greatest strength as an advertising network, that they ran ads on Facebook, was also it’s greatest weakness. One could argue that with over a billion users, Facebook’s advertising network was large enough, but that wouldn’t be true. Popular as the platform may be, there are demographics that are underrepresented on the social network. Facebook has launched a new ad network to address this issue. Facebook Audience will allow Facebook to display their highly targeted ads on mobile apps. This post will explain what Facebook Audience is and what it means for marketers. Because of the large amount of data Facebook has about its users, the company is able to send highly targeted ads to users. This is has made advertising on Facebook a winning strategy for internet marketing on desktop and mobile. The new Facebook Advertising Network extends these benefits to a wide range of apps that can join the network. It’s still a few months away, but there is a waiting list for those who wish to be early adopters. The official launch of the Facebook Audience Network is good news for advertisers, who will now be able to reach a large number of mobile app users with higher-quality, highly targeted ads. It’s even better for app developers who have been using Facebook Logins but weren’t able to directly make money from app users who were also Facebook users. The revenue potential means that the size of the network will grow exponentially once it’s launched. The best news for business owners and marketers is that it doesn’t take much effort to use the new Facebook Audience network. All it takes is one click in the ad settings and the system handles optimization and delivery to apps. There are three different ad types that marketers can use. 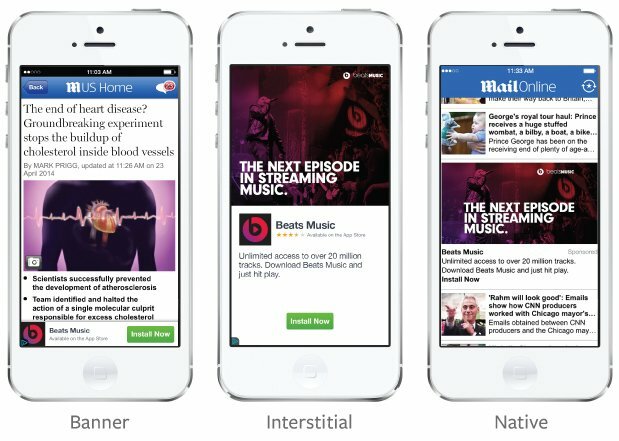 There are small banner ads that would show up at the bottom of the app, interstitial ads that are full page ads that show up between at various times when users visit different pages, and native ads that show up in the News Feed but are marked as “sponsored”. Consumers will undoubtedly see more ads as a result of this move, but Facebook has put in some safeguards to limit the annoyance. For example, publishers can only show one ad on the screen at a time, so there won’t be a bunch of ads at once. Additionally, ad creators “can’t disguise the ads in their interface, place them over buttons to score accidental clicks, or make clicking them the only way to exit a screen”, according to TechCrunch. Facebook will also be giving publishers a variety of tools to track engagements and conversions, basic demographic data, and other metrics about their ad performance. Publishers can even filter the ads that appear on their app by category. This way, they can reject ads about health, gambling or financial services ads or other things that aren’t appropriate for their audience. This is especially important for marketers who are using Facebook logins as a way to maintain compliance with the Children’s Online Privacy Protection Act that was passed last year. Though it’s still a few months away, Facebook’s new Facebook Audience Network will be a huge benefit for marketers who use Facebook for advertising. Marketers should start thinking now about the best way to use this new network to their advantage.